Costa Rican recipes are delicious and-and healthy- a combination that is often hard to find! There are also many popular recipes and dishes in Costa Rica that are vegetarian-friendly. 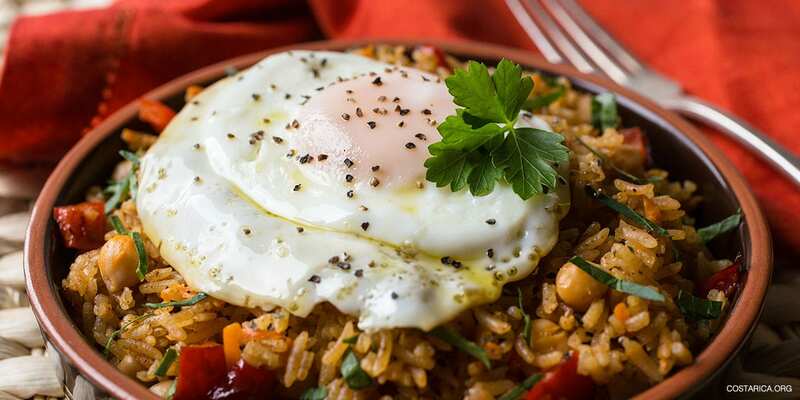 Perhaps the most famous is Gallo pinto–a meal that can be enjoyed any time of day and is often served with scrambled eggs or fried eggs and tortillas at breakfast. As with most Costa Rican recipes, the following recipes can be tweaked according to your tastes, but we think you’ll enjoy them. Buen provecho! Saute the onion, pepper, and garlic in oil for 1-2 minutes then mix in the rice and cook for another 2 minutes. Add the beans and Lizano sauce, making sure to mix all ingredients well and fry on medium heat for another minute or two. Cover the pan and let sit for 2 minutes. Serve with natilla (Costa Rican sour cream), a sprinkling of chopped fresh cilantro and enjoy. Yields 2 servings. Bring rice, water, 4 cups milk, evaporated milk, vanilla extract, and nutmeg to a boil in a saucepan over medium-high heat. Boil for five minutes, making sure to stir constantly. Add condensed milk and simmer over low heat for another 10 minutes. Slowly add in remaining 2 cups of milk, keeping the mixture at a low simmer and add raisins if desired and cook for another 10 minutes until the pudding thickens. Remove the cloves and cinnamon before serving; can be eaten hot or cold. Yields 6-8 servings. Blend mayo, mustard, salt and pepper in a bowl and add chopped hearts of palm. Lightly dress lettuce or Spring greens with light vinaigrette in a separate bowl and top with a heart of palm mixture. Maybe squeeze some fresh lime juice on top for an additional pop of flavor. Yields 3-4 servings. Heat the oil in a saucepan until bubbling. Fry the plantains on both sides for 2 minutes, or until a light brown color. Remove with a slotted metal spoon and place on parchment paper or a cutting board. Gently pound them flat with a tortilla press or kitchen utensil and fry for another 3-4 minutes until a deep golden brown. Dry with a paper towel and add a pinch of salt to taste. The plantains should be crispy and are a delicious accompaniment to refried beans. Yields 10 servings. These Costa Rica recipes are part of what makes Costa Rican food so unique. The flavor and natural ingredients will have you coming back for more! All these wonderful flavors will only add to a great vacation.